Palm Sunday,. 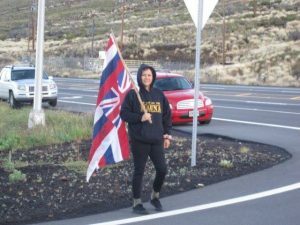 April 14, 2019 protest of “Champions of PTA” Breakfast and Bombing Day at Pohakuloa (PTA) 6:30-8AM. PTA was hosting a breakfast for its “Champions of PTA” at 7AM and then were going to take the “Champions” on a meet and greet to the troops 8-10AM firing heavy duty cannons etc. A couple of us stood in protest outside the main PTA gate. Judging from the very light traffic entering the base, not many “Champions of PTA” attended. On the third photo below you can see bomb debris clouds in the distant slopes of Mauna Loa. 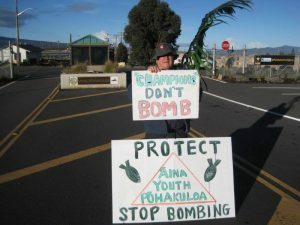 Our message was simple: Protect “Aina, Protect Youth, Protect Pohakuloa. Stop Bombing. Real Champions don’t Bomb! The live fire was heavy at times — cannons,rockets and helicopter gunships. Desecration of the sacred ‘Aina. Just like the First Palm Sunday — Desecration of the Sacred Temple in Jerusalem by Money changers.whose tables Jesus upset. Join the Protest at the PTA Main Gate on Thursday, April 18th 9AM till 1PM during the “Experience PTA” open House where school children, etc. are invited on to the PTA base contaminated with Depleted Uranium oxide particles, etc. Please pass the word about the protest. Mahalo. We have received word from the Dept. of Education Kona head,Art Souza, that due to our raising health concerns, no schools from the Kona side of the island will be attending “Experience PTA Day”. We have not heard about the Hilo side of the island if any, or how many, schools will be attending. Y’all wanna celebrate Earth Day? Start by not dropping bombs. Rather than let your keiki go to the Pohakuloa military base exposing them to health threats go visit an organic farm, fishpond, prepare a meal for the houseless, go pick flowers and make lei with kūpuna and talk story. Let’s actually care for the earth. That’s free too! Call to Action!!! Three ways to Protect Pōhakuloa! 1.) 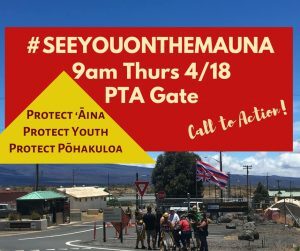 Please share on social media and ADD a photo of yourself and your loved ones with the message –Stop Bombing Pohakuloa, Don’t bring youth to Pohakuloa out of health concerns, etc. It should be noted that PTA is a 133,000-acre hazardous toxic waste dump from more than 75 years of live-fire training of weapons by the Army, Navy, Air Force and Marines. 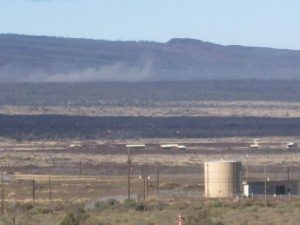 More than 14 million live-rounds are fired annually at PTA and Depleted Uranium (DU) radiation rounds have been used there. Please view the short video of Dr. Lorrin Pang, M.D., public health officer and retired Army Medical Corps explaining the health dangers of inhaling DU oxide dust particles (See https://vimeo.com/19153948). 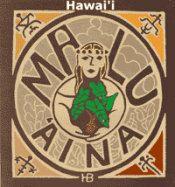 Malama Honua! Care for the Earth! Don’t Bomb It! Celebrate Earth Day! Stop Dropping Bombs! Y’all wanna celebrate Earth Day? Start by not dropping bombs. Rather than let your keiki go to the Pohakuloa military base exposing them to health threats go visit an organic farm, fishpond, prepare a meal for the houseless, go pick flowers and make lei with kūpuna and talk story. Let’s actually care for the earth. That’s free too ✌?